For those readers who might have a mortgage in Spain at the moment, this article will surely be of great interest to you. 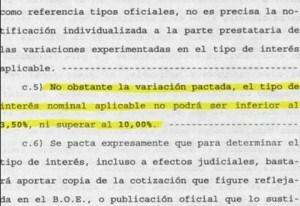 As you might probably know, the Spanish Supreme Court has recently ruled that the “Interest rate floor clause” can be declared abusive if the client/consumer might not have been duly informed before the signature of the mortgage contract at the Notary, about its content and implications, in a clear, transparent and comprehensive way. Last June 2013, the Supreme Court clarified a judgment delivered in May 2013 declaring floor clauses null and void if they breach the levels of transparency demanded by the European Consumer Directive. The clarification stated that within the context of a mortgage contract, the infringement of the indicated criteria was sufficient grounds for these clauses to be completely nullified. This specific floor rate clause imposes a limit on the extent to which consumers can benefit from lower borrowing costs, should the reference index used to set mortgage rates fall — in Spain the one-year Euribor interbank rate is usually used. (for instance 3,25%). In simple terms, it defines the lowest percentage of interest to be applied to the payments the borrower is to pay. 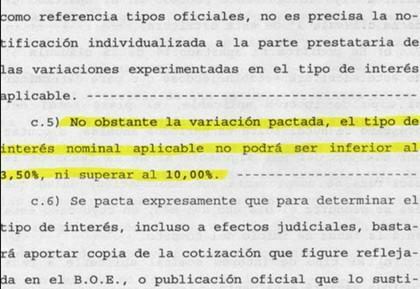 On the other hand, the “ceiling rate clause” (or “cláusula techo” in Spanish), marks a limit to the maximum percentage of interests to be applied to the liquidation of the mortgage. This clause can be also abusive because if it is too high, then it will not serve its purpose, which is to maintain an average monthly instalment through out the duration of the whole mortgage contract. b) or alternatively, if the Euribor goes down, (like the situation at present) the mortgage monthly payments will still be high due to the abusive floor rate clause, below which the applicable percentage will never go. The problem with this unfair clause is that many unreliable banks mentioned it (together with the “ceiling rate clause”) but in small print, without informing clearly to their clients even about their existence. • Can the extra interests unduly charged by the bank be claimed back? Getting your money back is indeed possible, but if the bank might refuse to reach an “out of court settlement”, it would be necessary to go to court. • What if the bank might accept to remove the clause, should I accept? Watch out, because your Bank might be trying to delude you!!! Bear in mind that some greedy Banks might still try to play you for a fool, by using all kind of dubious tricks, aimed to keep getting even more money from you, despite the removal of the abusive floor clause. For instance, we have detected that some savings Banks have recently provided clear instructions to their staff aimed to convince those clients who claim the removal of the mentioned clause, to change the original mortgage interest conditions, into a highly disadvantageous fixed rate type or alternatively by maintaining the same variable interest type, but with a higher differential rate or even with other hidden defective mortgage modifications. On the other hand, some banks will also try using unethical blackmail tactics. For example, they will readily accept the removal of the abusive clause, but in exchange of forcing you to hire some additional financial products, like house or life Insurance, risky financial products, etc. Finally, another commonly used trick consists of offering the client, the accumulation of all the debts in one new mortgage loan, also called reunification of loans. Beware! Apparently, the monthly quote might seem more attractive to you, but in reality, be very careful, because you might end up paying to the Bank much more costs and expenses, with higher interests and for longer period of time!! Therefore, should you be personally affected by this serious problem, as a preliminary step, we suggest that you kindly ask your bank to remove immediately the floor clause from the mortgage Deed but with no condition at all. Remember, that even if you might be national from another country, you have the same rights as a Spanish consumer! Secondly, do not sign any new novation agreement with the bank without consulting with an expert law firm, like “Ricor Abogados”. Third, if the bank might stubbornly refuse to remove the floor clause, please do not hesitate to contact us for further advice. We will be glad to help you in order to claim the nullity of your “floor clause” as well as to claim the refund of the interests overpaid paid on your mortgage contract. • What is the process of claiming against the banks through the Courts? Considering that according to experts, the Euribor is likely to increase within the next 2 years, time is of the essence, as failing to take speedy legal action now, might involve losing more tan 3.000 euros later on!! Subsequently, if you might finally decide at the worst scenario, to sue your bank, bear in mind that the sooner the better! We are glad to inform you that we are currently preparing several class actions. Clients are grouped together depending on the bank and we claim the amounts corresponding to each individual affected client. 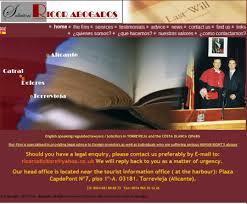 We do hope this information is useful for you and should you have any question or enquiry, please do not hesitate to visit our website www.ricorabogados.com and we will be delighted to assist. Thank you very much for your attention and we look forward to helping you! Spanish Solicitor and NON-PRACTISING ENGLISH SOLICITOR IN ENGLAND AND WALES”, under the “Solicitors Regulation Authority” (SRA) SRA number 519196.